My Wounded Soldier, Book 1 to be published July 4, 2015 !!! 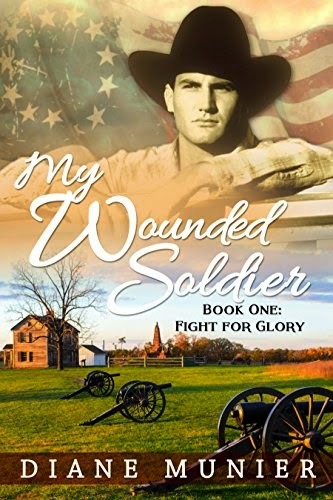 My Wounded Soldier, Book One: Fight for Glory, is my newest offering on Amazon available for pre-order. It goes live on July 4th, 2015. This is the saga of Tom Tanner and his reluctant love for Addie Varner. After he mustered out of the Twenty-Seventh, Tom never expected to follow the boys home to Illinois. Having failed to protect his older brother Garrett, Tom planned to take his wounds out west where a man could get lost under the endless sky. But his father prevailed on him to come home and comfort his grieving mother. Tom had nearly filled his obligation when the neighbor boy came running and calling his name as he worked in the field. Johnny was the boy that looked like his mother, Mrs. Varn. Tom had seen the woman at meeting. She rattled him some for he’d not had a woman, just that one time and he’d been liquored up and taking a dare and were he to have one, she was not hardship to look at. But Johnny was calling for him. Tom knew the sounds of war. The country was rife with veterans, some looking for trouble instead of home. What Tom finds at the Varner’s farm offers him a new kind of battle, a new kind of glory trail. I have been writing this story for fifteen years. In its various forms it has garnered attention in literary contests and with a number of writerly folks. But stuck in ‘bridesmaid,’ mode it has never really walked the aisle. Until now. I hope you give it a spin and maybe fall in love.